Coming out of Paris, Federer-philes were understandably buoyant. Their man had not only ended the amazing 43 match winning streak of the "other" member of the Big Three, Novak Djokovic, but he lost to Rafael Nadal! Well, he lost to Nadal on clay, but not as badly as usual! He won a set! Suddenly, for a segment of Federer fans it was going to be 2007 all over again. If he could win a set against Nadal in the finals of Roland Garros, well, he was obviously going to win Wimbledon outright, so went the party line. So what happened? Weren't the Nadal and Djokovic matches in Paris signs of things to come; signs that conventional wisdom be damned, Federer, fast approaching age 30, was going to reclaim his Wimbledon crown? Weren't those matches signs that Federer was going to finally get that extra week at No. 1 that would finally let him match Pete Sampras as the longest running ATP No. 1, one of the few records he doesn't already own. In all fairness, in Paris, Federer opened with a 35 minute blitzkrieg of inch-perfect tennis. Nadal was down a set point at 2-5 in the first when the Swiss missed a casual dropshot by maybe two inches. Suddenly, immediately, the Fed Express was derailed. Nadal went on a run that saw him claim a first set that had been presumed lost, as well as the second. 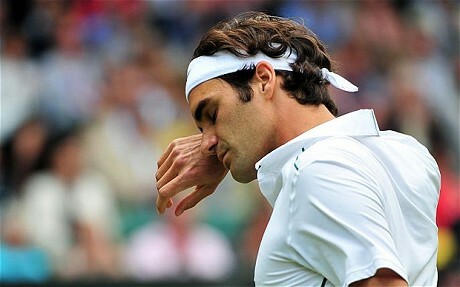 Federer regrouped, taking the third set in inspiring fashion, from a break down. 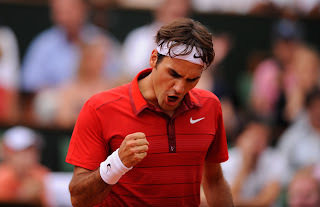 Then Nadal raised his level while Federer's dipped, with the Swiss capitulating 6-1 in the fourth set. Federer still plays inspiring tennis, but with age has come inconsistency. Overall, he played an extremely clean match. 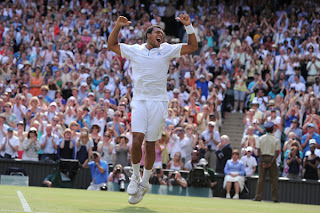 His winners to unforced errors ratio was 57-11; Tsonga's was an equally impressive 63-22. Federer lost by dropping a single break in each of the final three sets. While Federer may have won 10 more points in the match than Tsonga (145-135), our sport's scoring system rewards amassing a number of smaller victories (points, games and sets). In tennis, what matters are the proverbial "big points." That's where Federer faltered. Also credit Tsonga, who's as long on talent as he is on maladies. The perpetually injured Frenchman did what so many of Federer's opponents over the years couldn't. He held his nerve. In years gone by, Federer would take a two sets to love lead and his opponent would just look to his coach, signal "airport," collect his bag and walk away. Nadal, the rare exception, owes his success as much down to the technical matchup of their strokes as to his own never-say-die mentality. Nadal was the first to truly believe he could beat Federer whenever they played. I chalk it up to their first match in 2004. An 18 year old Nadal, on the verge of being in the Top 50, upset the then newly minted World No. 1 in straight sets in Key Biscayne. Federer would win their next matchup in five sets as a young Nadal's fitness faltered, but even then the Spaniard was two points from the win. The memory of those early tilts played a huge role in Nadal's ability to stand toe-to-toe with Federer even in his full-flight era. The rest of the tour, save David Nalbandian, never really got those early shots in, and Federer was perhaps the best player ever at slamming the door on his opposition. From 2004-2007 Federer never gave more than a modicum of hope. In that stretch Federer went 315-24. At Wimbledon, he ran the table, 28-0. How good is that? Imagine the Red Sox or Yankees losing literally 12 games per season two seasons running and then sweeping the playoffs for good measure. Impossibly good, that's your answer. Of those 24 losses in four years, fully eleven were to either Nadal or Nalbandian. Yes, Federer lost here last year, but lightning wasn't supposed to strike twice. Between the aggression-infused game that new coach Paul Annacone imparted upon him, the strong performance in Paris and the fact that this is Wimbledon, many Federer-philes were blindsided by yesterday's upset. The most ardent fans understandably often have a hard time seeing all the facts. Where Federer is faltering these days is in his consistency. He can't summon sustained greatness every time he steps onto the court the way he once could. He can play a blinding match, as he did against Djokovic in Paris, a couple of stellar sets like he did against Tsonga yesterday, but more often than used to be the case, Federer finds himself unable to win the close ones. When he has to find his best tennis, he can do it in fits and starts, but it's harder to sustain it across two weeks, or even across a match. After a period of near invincibility. Roger Federer has become surprisingly, unbelievably human...even at Wimbledon. Fake dior can be self-winding along with water resistant for you to 330 foot (100 feets), comes with a personalized tachometer bezel, along with material call using gold. Your fake dior will still only always be water-repellant pertaining to 100 foot (40 meter) going that is certainly if only you simply purchase your fake breitling. (Your Daytona imitation breitling Imitation can be acquired throughout Qualities only two -- 5 along with, The modern variation presented significant knobs along with got the inside course in a very in contrast to coloring. Call hues involved dark-colored, bright, champagne bottle along with every single enjoy got "Daytona" throughout crimson for the call. Your remarkable issue with regards to these kind of designer watches can be that you've a new cartier replica for every single job. You've got much of preference in relation to choosing a replica cartier watches you are surely destined to get indulged pertaining to alternative.